Project obstacles and solutions: Purdue University was updating its Northwest Athletic Complex to include a new baseball stadium and improvements to the adjacent soccer complex. Shiel Sexton was selected to construct the $21 million complex. IMI produced over 5,000 yards of concrete to be used in this project. 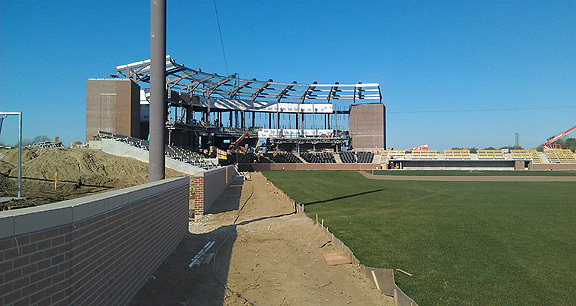 The baseball stadium has a seating area capacity of 1,500 which were constructed with cast-in-place concrete. The dugouts were also cast in place. The stadium includes large veranda areas and sidewalks were put in place for easy access and crowd movement throughout the facility. The soccer complex was updated to include a new locker room and lounge, meeting areas, concessions and restroom areas. A new grandstand was also constructed. This project won the 2012 IRMCA Outstanding Concrete Award for Concrete Commercial/Industrial–Public & Institutional.